This is a good Computer science and IT project report on LGI Monitoring system. LGI stands for Loans, Grants-in-Aid and Investments. The project is windows based and the main idea of this project is to handle the all details of Loans, Grants-in-Aid and Investments. The project has been developed to smoothen the processing of Loans and Grants-in-Aid cases in the Ministry of Finance. 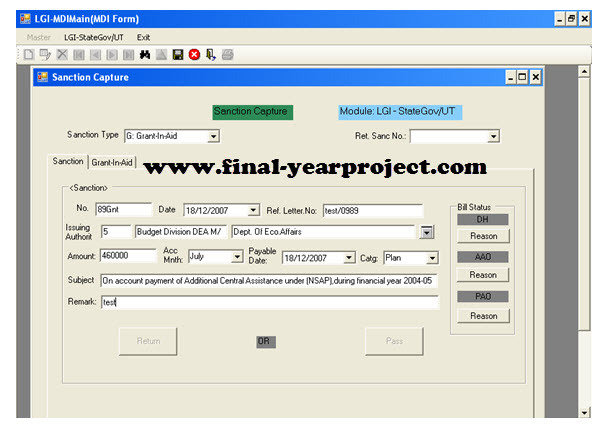 The purpose of the project is computerized processing of cases in systematic manner from filling of sanctions details and their report generation for RBI You can also Subscribe to FINAL YEAR PROJECT'S by Email for more such projects and seminar. This software will enable an individual person who is authorized to keep track all the information which is filled. This software is passed through from three phases. This software system will help in automating all the processes like filling of Loans, Grants and Investments details or application will now be computerized. This is a VB.Net based project and use SQL Server2000 as backend software. The report contains Data flow diagram, screenshot, flow chart and other information for your reference and help.